They are designed to be very difficult or almost impossible to downgrade or use an alternative operating system, and even more difficult to fix or restore. The hot keys for getting into the BIOS don’t work because the computer never displays any kind of BIOS splash screen. Hammering DEL, ESC, or F12 doesn’t seem to work either. Every one I’ve encountered so far comes preconfigured with Secure Boot enabled which blocks any unsigned boot loaders from loading. They also don’t come with any type of optical drive anymore, so bootable restore media is out of the question. 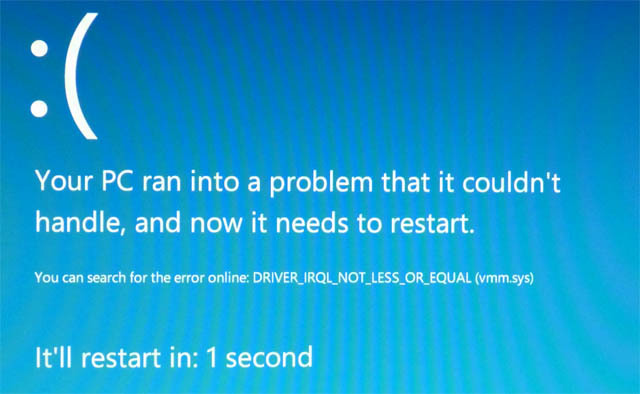 The only way to get into the new EFI bios or into any kind of system restore menu was to first boot into Windows; which I couldn’t do because I kept getting a frowning error screen. Who thought this was a good idea? I also encountered another laptop that had a botched Windows 8.1 upgrade and refused to boot. It just kept trying and failing to redo the upgrade, never reaching the promise land. Since we’re on the subject of Windows 8.1; Why bring back the start button if you’re not bringing back the actual start menu?